English lavenders are best for cold winter areas for they are the hardiest available. 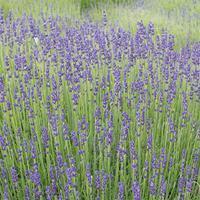 This new lavender has abundant large (4") purple-blue fragrant flower wands and striking silvery foliage. Perfect for pots or garden hedges in well-drained soil, for fragrant cut flowers and more; bees and butterflies love the nectar-filled blooms. A must have new perennial! Southern gardeners will appreciate the quality of this variety, for it has disease resistant foliage and a strong rot-resistant root system. Northern gardeners will thrill over its hardiness. 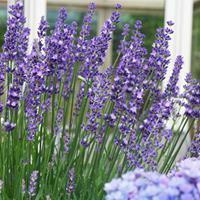 A vigorous variety with tall strongly fragrant lavender purple flowers flowers in late spring and early summer. For best winter survival, perhaps into zone 5, plant in well-drained soil on a small mound, mulch with gravel, and do not cut back until spring growth begins. Patented.